Hello, I was bored so I decided to make a language changer (source included). To get this working in your EO projects… There’s a lot that needs to be changed. Then you copy the modLoad, modConst and modType data from my source into your server. 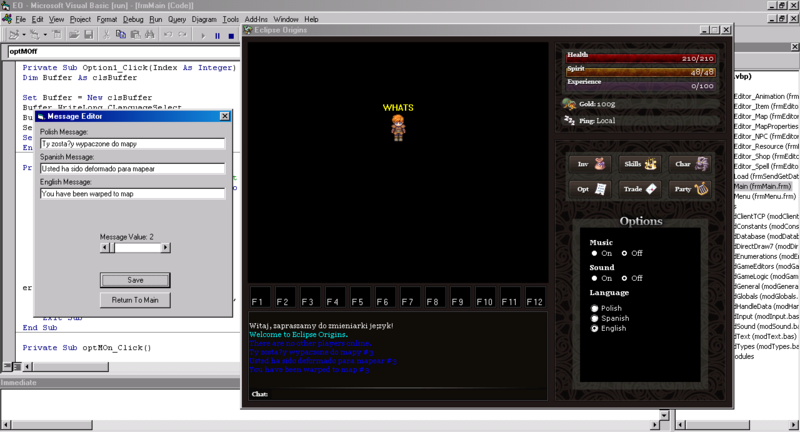 Then create an option button on the client so your player can choose which language. Send the option value to the server. Run the Language Changer program inside your server folder, use the Message Editor to create your messages. You may also want to add a Player(index).Language type to record that players language value. Thanks. Certainly come in handy.